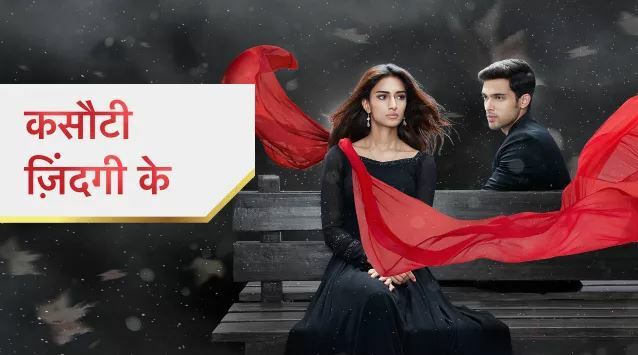 The Episode starts with Nivedita saying I know Anurag has feelings for Prerna, but he will forget her soon, Mishka has come in his life, Prerna has insulted me, and she won’t get another chance. Anupam says you won’t change. She says whatever will happen, it will be good. Mohini sees Anurag getting ready and cries happily. Anurag sees her and comes to her. He asks what happened, why are you crying. She says I m very happy and hugs him. She says when I look at you, I feel everything is good, you are about to enter a new phase of life, you are going to begin a new relation, my young Anurag has grown up, its the happiest moment of my life, I m proud, thank you. She hugs him. He asks are you happy. She says I m very happy, thanks. He says stop crying, your make up will be ruined. She says don’t talk like Moloy and goes. Moloy comes and says she talks so sugary, don’t get trapped, no doubt she loves us a lot, but we feel like we are doing things as we want, no we are behaving as she wants. Anurag smiles and asks what happened today that you didn’t wish. Moloy says she convinced me for your engagement. Anurag says she is very happy. Moloy asks are you doing this for her happiness. Anurag says no, I m also happy. Moloy asks what about you told me in office. Mohini comes and takes Moloy with her. Anupam comes to Anurag. Anurag says you are coming out of my washroom. Anupam says sorry, my washroom had some problem, so I used yours, by the way, did you think of the dream. Anurag says no, its weird, we often think about people around us, its meaningless. Anupam goes. Anurag thinks I wish I could tell Prerna about my engagement, but I guess Nivedita wanted to tell her. Prerna cries and thinks of Nivedita’s words. Shivani asks her not to attend engagement. Prerna says I m upset, but I m happy for Anurag. Shivani says I will stay here with you. Prerna says no, I will have to go, Anurag has always supported me, its an imp day for him, I have be there for him like a good friend. They cry. Aankhon me….plays…. Mohini gives chunri and asks Anurag to offer it to Kuldevi. He thinks of Prerna. He says I recalled something seeing this chunri. Mohini says you recalled the pandal, this chunri is similar to the one which you saved from fire, I m very happy. She kisses him and smiles. She asks him to get ready fast and goes. He says mom says, whatever happens is for good, thank God you met me that day. Komolika, Chobey and Mishka arrive. Komolika’s accessory drops. Mishka picks it and says I think its something valuable of Komolika. Chobey says if thing is imp, Komolika doesn’t miss it, she doesn’t lose time. Mishka says maybe her focus wasn’t on this, I m also your daughter, you can appreciate me and feel proud, its imp day for me, I chose Anurag, Komolika didn’t choose him. Anupam and other men stare at Komolika. Nikka….plays…. Anurag sees her and says she, here? Anupam thinks why is she seeing Anurag with love, even I m handsome. Anurag and Anupam come downstairs. Nivedita says good to see you here. Komolika greets them. Mohini says you would have met the rest of the family, but this is my son Anurag. Komolika forwards hand and shakes hands with him. Anupam forwards hand to her. She does Namaste. She says I know you are Anurag, you know who am I. He says yes, we met before. She says I m Mishka’s sister. He gets surprised. Mishka greets everyone. Chobey says this is our second meeting, we didn’t know we will meet as relatives, I m happy Mishka has chosen a talented guy, I hope he will keep Mishka happy. Komolika says lucky you, he is a handsome, charming and different guy. Mishka agrees. Komolika thinks Anurag seems to be waiting for someone. Anurag thinks where are you Prerna. Prerna and family comes. Rajesh says this gift is nice. Suman says don’t know what will Mohini tell us. They all talk. Prerna is lost. Shivani asks her to come. Anupam stares at Komolika. Nivedita asks him is he staring at Komolika. She says please don’t embarrass me. He says you might divorce me if I explain. She says the day I feel I can’t tolerate you, I will give you divorce. She goes. He says I m staring at Komolika as she is weird and mysterious, she is interesting. Anurag gets Sid’s call and says it happened suddenly, can you hear me. Komolika comes and says you are talking to your close friend right. He says I will pacify my friend. She says its your habit to break hearts, you upset your close friend and me, you made me fall, if you let me go this time, I will take you home and keep you captive until you make me happy, I m going to have some rights on you, as I m going to become your Saali. He smiles seeing Prerna at the door. Prerna’s dress gets spoiled. Anurag helps her. Prerna falls down the stairs. Anurag drops the ring and runs to hold her in arms.